All bass players are familiar with the problem of their endpin slipping. The high-tech solution to that problem is the Manson Superspike. 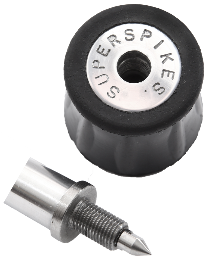 E ach Superspike is individually made to the player's specifications, which can include the addition of grooves in the rod at specified intervals. Grooves are not recommended on small diameters, 5/16” and 8mm, unless the endpin is very short. If grooves are required, please add a note on the order form. The cover is removable to expose the point. The owner's initials (maximum 7 letters) are marked on the exposed face of the cover. The marking is helpful if the cover is mislaid, or in situations where several or all the players in a section have Superspikes. In addition to the traditional rubber ferrule which we have always supplied, we now have plastic/rubber composite ferrules. They are very hard-wearing, but being somewhat less grippy than the rubber ferrule, they are best suited to people who play standing up. You may also be interested in our bridge adjusters and C-string tuner.